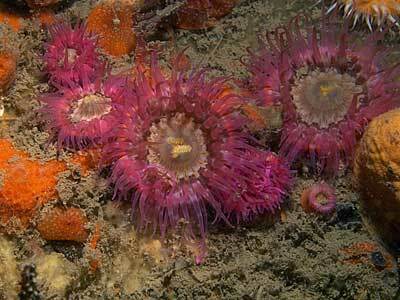 Description: This sea anemone has a closely adherent base. The column is not divided into regions and has numerous suckers, appearing as pale spots, present on its upper part. 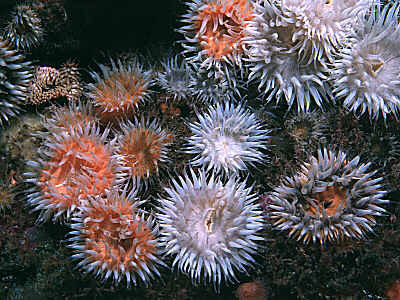 The tentacles are moderate in length, not more than about 200. Acontia are readily emitted. Size up to 30mm across base. Colour very variable: column may be red, brown, orange, greenish, or whitish. Typical variety miniata has a patterned disc, usually incorporating red, white, brown, orange, etc. Other distinct varieties are: venusta, orange disc, white tentacles; nivea, white disc and tentacles; rosea, disc variable, often patterned, tentacles pink or rose-red; aurantiaca, disc variable, often patterned, tentacles orange. Other, intermediate varieties occur and often the disc has a rayed effect due to alternate light and dark coloured segments. Reproduces by basal lacerations. Habitat: On shore in caves, pools, etc., or sublittorally down to about 50m. Often occurs in large aggregations, particularly in areas with strong currents. Distribution: Common, often abundant on all coasts of the British Isles and throughout western Europe, including the Mediterranean. Similar Species: Only Sagartia troglodytes and Cereus pedunculatus possess suckers on the column; In these two species the suckers usually have gravel stuck to them. In Sagartia elegans the tentacles are not usually arranged in a regular manner; in the other two species the tentacles are arranged neatly in multiples of six. Column with suckers; these rarely have gravel stuck to them. Picton, B.E. & Morrow, C.C. (2016). Sagartia elegans (Dalyell, 1848). [In] Encyclopedia of Marine Life of Britain and Ireland.